It all didn’t start with this book, but rather Choose Mexico for Retirement. I went to college in Mexico, graduating in 1977, and also spent 16 days there in December 2003/January 2004 on our honeymoon. My first inclination was to retire in Mexico. My wife, Gloria, spent a few days in Costa Rica back in 1996 and said that we should check-out Costa Rica too; consequently, we purchased both books. I read Choose Mexico for Retirement first and zeroed in several towns – San Miguel de Allende, Oaxaca, Guanajuanto and Xalapa. I know Mexico and had visited these cities. They were wonderful, but something kept pulling me away. It was the violence on the border, the kidnappings in Mexico City, armed soldiers in the zocolos, and the general poverty. During my three years there, I never had a bad experience, but back then, there weren’t 20 million Mexicans in the U.S. either, looking for a better life. 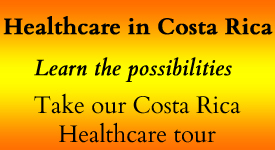 So I read Choose Costa Rica for Retirement. From the book, this “third world” country almost seemed advanced! 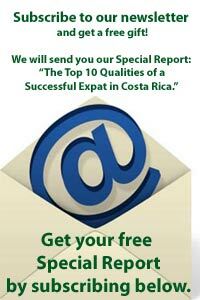 I reflected, “Have I ever seen a Costa Rican in the U.S. looking for a better life? ?” No, never! Choose Costa Rica for Retirement, by John Howells, took me on quite a journey, introducing me to a country that seemed far superior and safer than Mexico. From my days as a boy, reading National Geographic, I remember that Costa Rica used to be called the “Switzerland of the Americas.” Choose Costa Rica for Retirement teased us, wetting our appetites for more information, but it solely set us in motion to take our inaugural tour of the country. 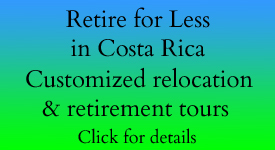 This book is full of good reasons to consider Costa Rica for retirement. It will quickly inform you that Costa Rica has had no army or navy since 1948. 27% of their budget is spent on health care. And it’s been a democracy for over 100 years. Those who settle here are, in a sense, on a permanent vacation, and that may be the best reason of them all.